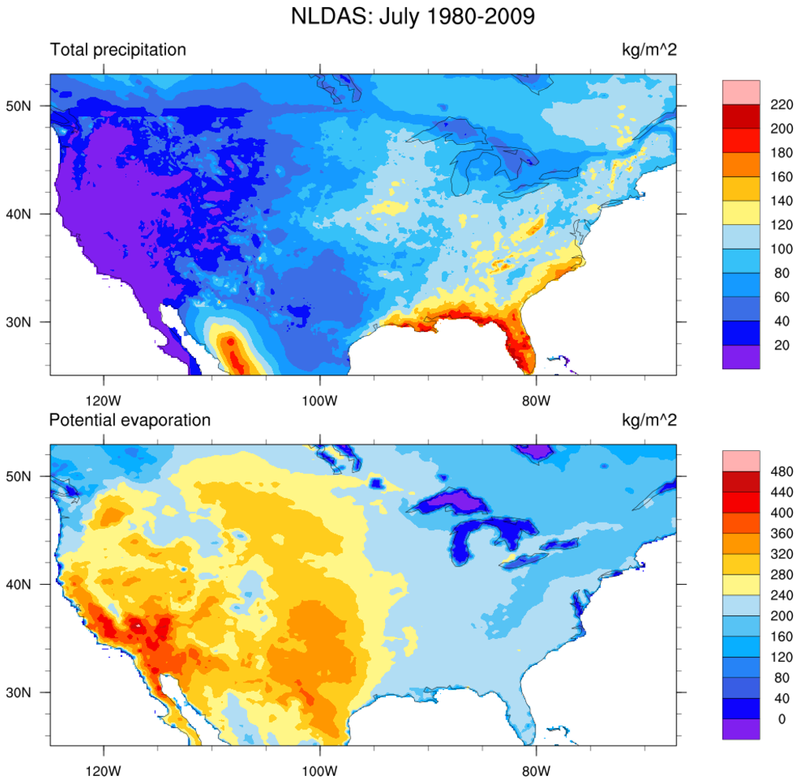 The NASA Goddard Space Flight Center Hydrological Sciences Laboratory (HSL) and Goddard Earth Sciences Data and Information Services Center (GES DISC) create and make available the following data sets. 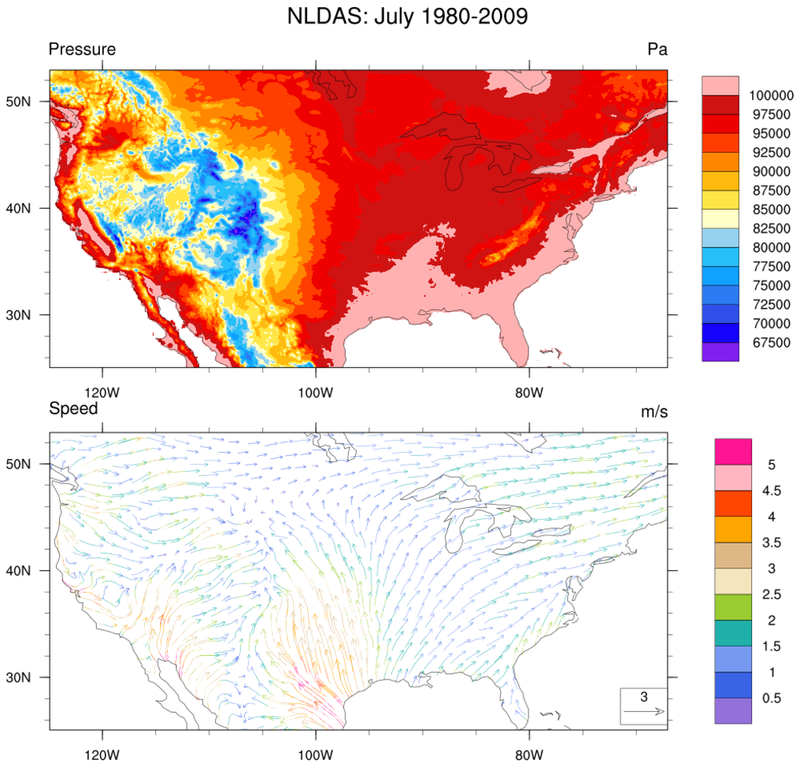 The goal of the North American Land Data Assimilation System (NLDAS) is to construct quality controlled, and spatially and temporally consistent, land surface model (LSM) datasets from the best available observations and model output to support modeling activities. More information about NLDAS is available. 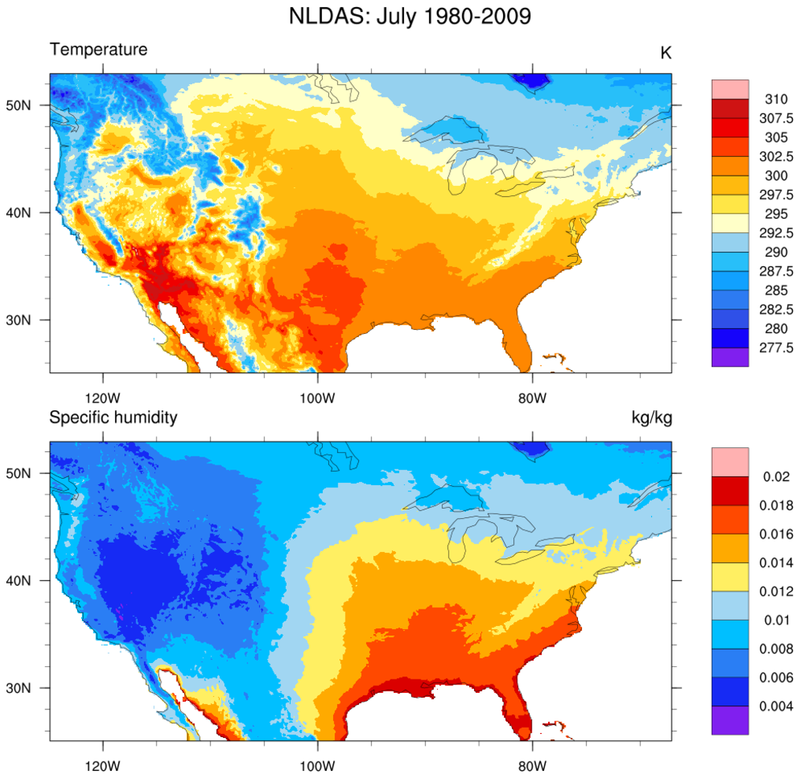 The Global Land Data Assimilation System (GLDAS) generates a series of land surface state (e.g., soil moisture and surface temperature) and flux (e.g., evaporation and sensible heat flux) products simulated by four land surface models (CLM, Mosaic, Noah and VIC). The 1.0 degree resolution data range from 1979 to present for the four models. 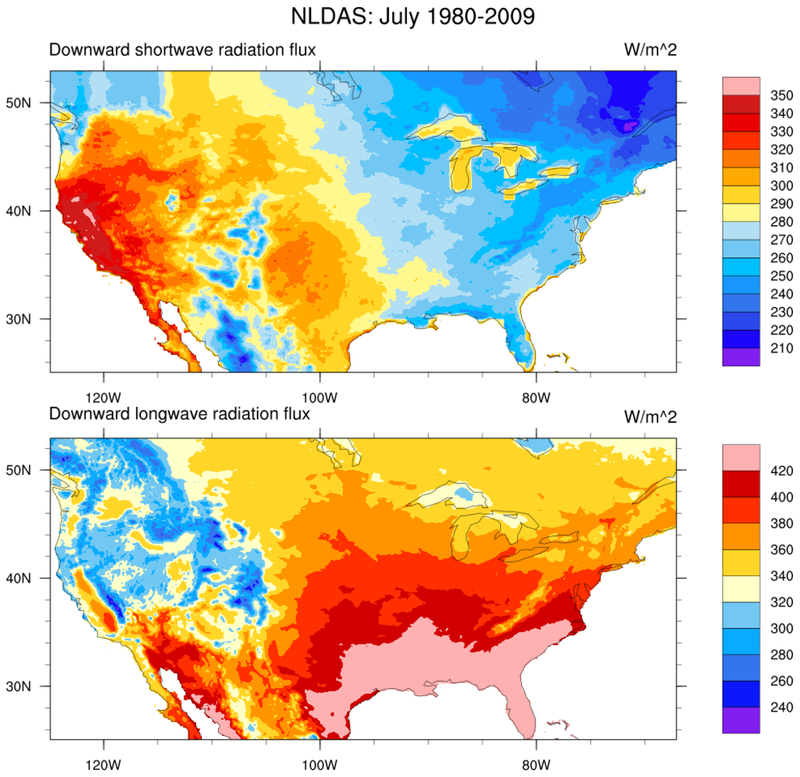 The 0.25 degree data cover 2000 to present for the NOAH model. More information about GLDAS is at http://www.asprs.org/a/publications/proceedings/portland08/0020.pdf. available. 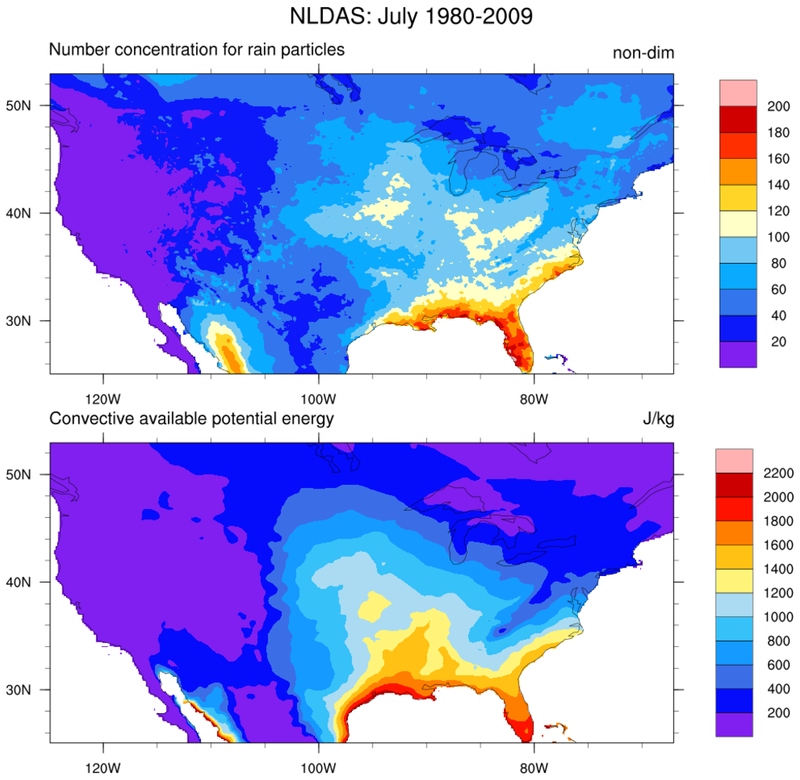 In November 2015, NASA-GLDAS released the Energy and Water cycle Study (NEWS) Climatology of the 1st Decade of the 21st Century Dataset, and its availability. See http://disc.sci.gsfc.nasa.gov/uui/#/search/NEWS. This data set summarizes the original observation-based mean fluxes of Water and Energy Budget (WEB) components during the first decade of the 21st century, for each continent and ocean basin. These data are summarized on both monthly and annual scales, as well as means over all oceans, all continents, and the globe. A careful accounting of uncertainty in the estimates is included. 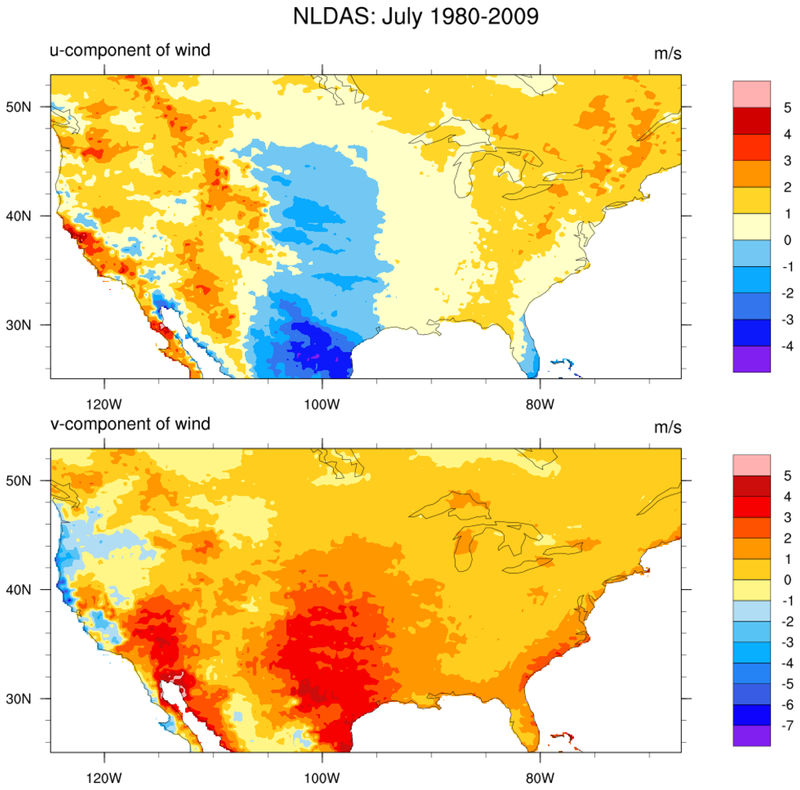 More information on and access to these data are available at http://disc.sci.gsfc.nasa.gov/datareleases/news-web-climatology-data-set-version-1.0-released-by-nasa-ges-disc.. The default format for LDAS files is GRIB. NCL can read GRIB files directly. In addition, NCL provides additional information [eg, geographical coordinates] that are not on the original GRIB formatted file. The ncl_filedump utility can be used to view any GRIB [nc, hdf-sds, hdf-eos] file as seen via NCL. Users should use this tool prior to processing to see how NCL creates the variable names. NCL has a builtin suite of GRIB parameters tables. Not all possible GRIB tables are included. Additionally, these parameter tables can change and new ones are created. NCL developers do not have the time to keep current on all updates or new tables. However, NCL does allow users to input any GRIB table. See the description of how to do this here. When NCL encounters a parameter-ID (GRIB parlance for a variable) that is not recognized, it correctly unpacks the variable and issues a warning message. The user can add the required meta data directly into an NCL script. See nldas_01.ncl. nldas_01.ncl: This script demonstrates how to quickly read a NLDAS GRIB file into NCL. A variety of variables are plotted.